Auburn (N.Y.) - Concerning a request for legal assistance to help Greene absolve himself from a crime he claims not to have committed. Great Barrington (Mass.) 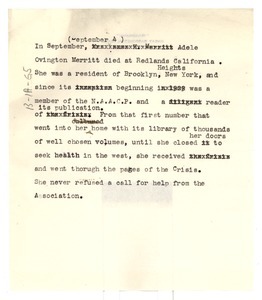 - Announcing the death of Adele Ovington Merritt. 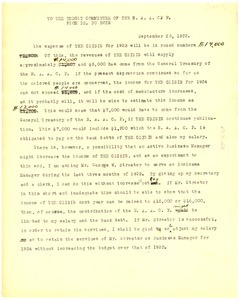 New York (N.Y.) - Regarding the financial condition of the Crisis. 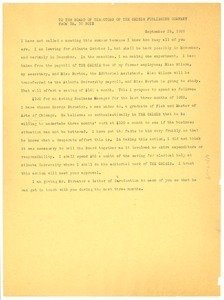 New York (N.Y.) - Du Bois explains why he has not called for a meeting of the Board of Directors of the Crisis Publishing Company; explains changes in the Crisis' budget. New York (N.Y.) - Introducing George W. Streator as the Acting Business Manager of the Crisis. 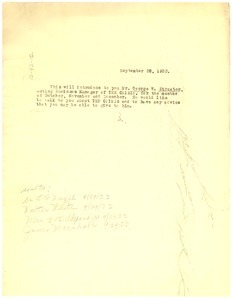 Tuskegee (Ala.) - Concerns status and financing of "Encyclopedia" project. 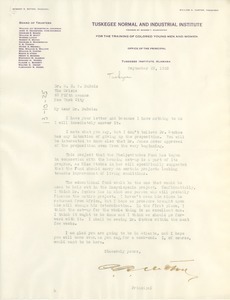 Written on Tuskegee Institute letterhead. 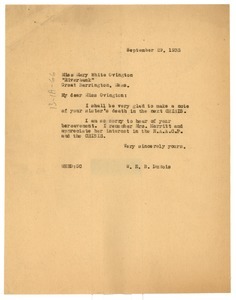 New York (N.Y.) - Du Bois agrees to make a note of Ovington's sister's death in the next Crisis. 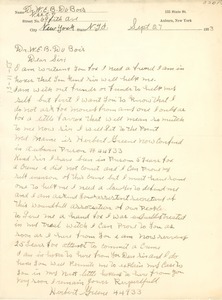 P. J. Durham Company, Inc. 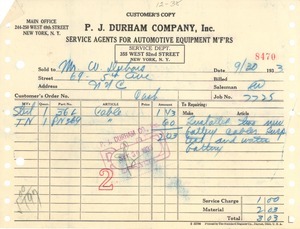 Receipt from P. J. Durham Company, Inc.
New York (N.Y.) - For new battery cables for W. E. B. Du Bois's Willy's Knight automobile. 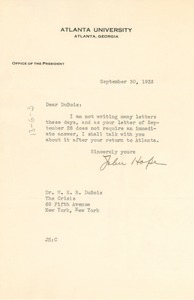 Atlanta (Ga.) - Concerning Du Bois's letter of September 26. 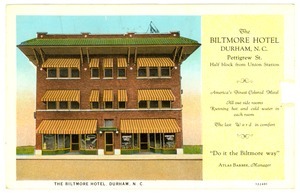 Durham (N.C.) - Noting a closed contract for December, most likely referring to an advertising contract with the Biltmore Hotel, "America's Finest Colored Hotel."